Stencil paste, also called embossing paste, is a thick compound used with stencils to create raised designs on paper, wood and other craft mediums. The paste is generally applied in a thick coating, and then scraped or wiped clean with a craft knife or other tool. Because of the thickness of the brass stencil typically used, the paste is left as a raised design. Stenciling paste, however, can be expensive. One of the simplest and most inexpensive alternatives to purchasing the paste pre-made is to mix your own at home. 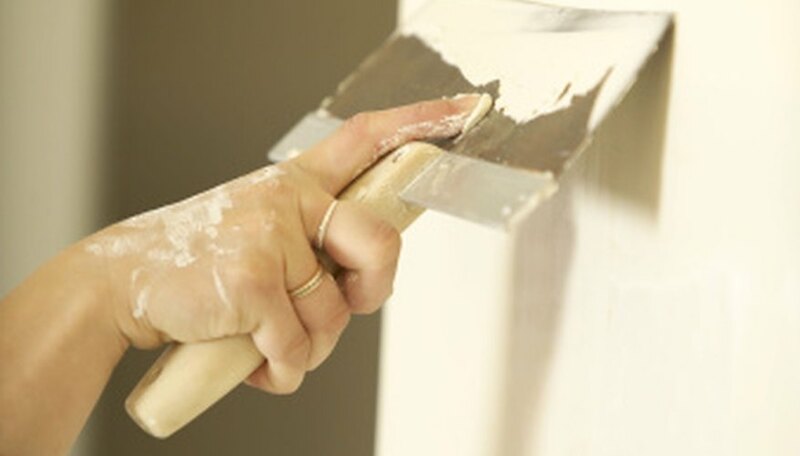 Use the palette knife to scoop out the amount of spackle you will need for your project. Place the spackle in the mixing bowl. Wipe the palette knife clean and use it to scrape the side of chalk or a pastel crayon. Continue to add this color to the spackle and mix with the palette knife until you have reached the desired shade. For brighter colors, dye can be added instead of the chalk. The embossed design can also be painted after drying. Use this mixture as you would any craft supply store purchased stencil paste.